Hannah Altman (b. 1995) is a Jewish-American artist working in Richmond, VA. Her interdisciplinary practice explores interiority, femininity, and the tools that perpetuate them using photographic based media. Her work navigates the relationships between body, environment, material, and perception. Altman’s work has been internationally exhibited and published. She has had solo exhibitions with the Pittsburgh Cultural Trust and Junior High in Los Angeles, among others. Her work has been published in a multitude of digital platforms, including the Carnegie Museum of Art, Vanity Fair, and Buzzfeed. Her work has been printed in numerous anthologies, including Australian Fashion Industry Broadcast’s Masters of Photography and Italian Loredana De Pace’s All For a Reason: Ten Reflections on Photography. She is an MFA candidate at Virginia Commonwealth University. The first semester of my graduate studies has been primarily focused on Judaism and its relationship to familial narrative and collective truth. I’ve been thinking about interiority by virtue of an eruv, a Jewish ritual object that distinguishes a private space from a public sphere. An eruv is a continuous wire that behaves as a physical enclosure, a demarcation of a private area in a communal space. Such a space is needed on Shabbat, when the carrying of a burdensome object from private to public domain is forbidden. As such, the presence of a continuous line allows one to carry a burden. 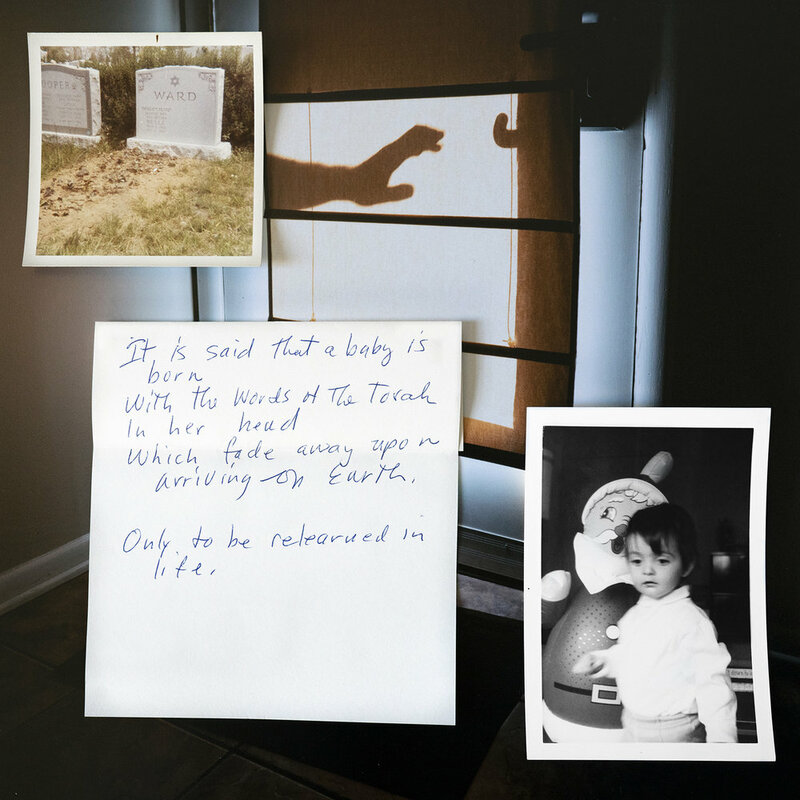 These photographs consider how this idea relates to a familial bloodline. Once inside this private space of burden, what does it look like? To address this, the images explore intergenerational Jewish memory, physicality, and sense of place. Thinking about how a biography of a family is built from multiple members’ individual life experiences, the images consider the possibility that multiple truths exist at once within the same home, or even within the same body, as the product of multiple genealogical behaviors and experiences. A lot of things attracted me to this program initially: The faculty is wonderful. They’re decided to both their practice and their students. Richmond has a really interesting art scene that is largely oriented around VCU and its good reputation. The funding is generous, and I’m practically living in the library. It’s huge and beautiful. VCU is a research based facility, and that is a really good fit for my work, which typically relies on a lot of reading and conceptualizing. The way photography is broadly approached in this program is influential to me as well; the experimental nature of the school has been helping improve my visual literacy and think critically about the future of the medium. I’m also a Sinai Scholar at VCU this semester, which focuses on contemporary Jewish thought, and the verbal discussions in these classes have been greatly informing my research. I started from square one upon entering this program, having recently completed a two year photographic textile project prior, and I’m really excited about how my new ideas are developing here. I’ve only been here for a few months, having recently moved from Pittsburgh, but from what I’ve experienced there’s a great art scene here that is heavily rooted in VCU Arts but extends beyond that as well. The VCU Institute for Contemporary Art newly opened in Richmond, and it’s incredible. There are a lot of easy avenues to meet people, show work, and go to shows here. There seems to be something for everyone from DIY space Valet (the first year photo MFAs are showing work there at the end of November!) to the Virginia Museum of Fine Arts, with a lot of galleries in between. My best advice, given to me in several forms by different people but ultimately relaying the same idea, is to treat feedback and critique as if you are reading a book. You don’t necessarily need to absorb every sentence; if one statement feels more beneficial for your work over another statement, focus on that. Of course, listen to the harsh feedback and take it in stride, but react instinctively informed in your work moving forward. What advice do you have for prospective students looking to attend your school? Specific to VCU, keep in mind the photography program is small (there are eight of us this semester), which to me means ample, quiet studio space and a small immediate community. A lot of us collaborate in other departments at VCU and beyond. In general, my best advice is to only apply to graduate programs that really excite you. Do your research. Look into who is graduating from these programs and reach out to them. Also, come visit in person. It’s crucial and exciting. Our school’s graduate open house is on November 10th!